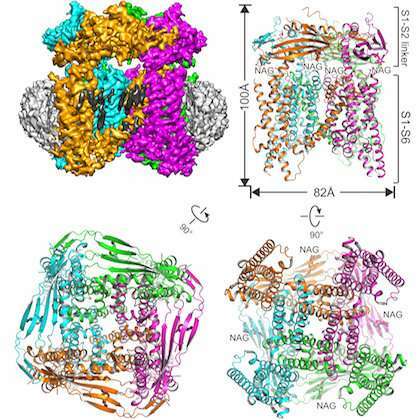 UT Southwestern Medical Center researchers today published a 3-D atomic structure of the ion channel found in mammals that is implicated in a rare, inherited neurodegenerative disease in humans. The work marks the first such structure determined using the university's $17 million cryo-electron microscopy (cryo-EM) facility that opened last year. In cryo-EM, samples are rapidly frozen to prevent the formation of damaging ice crystals and then viewed at minus 321 degrees Fahrenheit (cryogenic temperatures). UT Southwestern's facility - which runs round-the-clock - is one of the world's top facilities for cryo-EM structural biology. Their study, published online by Nature, comes just a week after three developers of cryo-EM technology were recognized with the 2017 Nobel Prize in Chemistry for their work on the instruments and methodologies that sparked the "resolution revolution." Cryo-EM enables atomic-level views of proteins that resist the crystallization necessary for traditional X-ray crystallography. "Functioning ion channels are needed for the proper movement of electrically charged particles - ions - in and out of cells and organelles to run cellular processes," said Dr. Youxing Jiang, Professor of Physiology and Biophysics, an Investigator in the Howard Hughes Medical Institute (HHMI), and co-corresponding author of the study. "Due to its link to that class of lysosomal storage diseases, TRPML1 has been a potential target for small-molecule therapeutics and several potential agonists (channel openers) have been developed," said Dr. Jiang, a W.W. Caruth, Jr. Scholar in Biomedical Research. Determination of TRPML1's structure could aid in the search for treatments for mucolipidosis type IV, he said. UT Southwestern's cryo-EM facility houses three high-tech instruments, including a 12½-foot-tall, 2-ton Titan Krios that shoots a high-powered beam through each sample while a special camera captures images of the scattered electrons that result. A robotic arm inside the machine can hold and precisely move a dozen flash-frozen samples in an automated manner so that thousands of images can be recorded, processed via computers, and interpreted to generate 3-D images for study, the researchers explained. "For a long time, detergent has been used to extract proteins from membranes for study. People have suggested that detergent might change the protein structure from its native state," said Dr. Xiaochen Bai, an Assistant Professor of Biophysics and Cell Biology and the study's second corresponding author. "Membrane proteins, such as those we studied, are usually wrapped in lipids. Nanodiscs are used to provide a native environment for the protein sample." "He spent day and night in the lab working on method development for cryo-EM. One of his great contributions was the development of a new type of camera to take better pictures of the proteins studied with cryo-EM," Dr. Bai said. "When I first moved to England, he gave me a lot of guidance and support and we had many discussions about cryo-EM techniques."